"The kasbah of JADE and SPA". Quiet, luxury and refinement. Heated pool, jacuzzi. At this moment, the neighbor is doing work in his Riad, We ask you to excuse us from the inconvenience. Located in the heart of the Medina of Marrakech, in the royal district of Kasbah, near the Saadian tombs, our guest house, the Riad "The kasbah of Jade" offers a sanctuary away from the bustle of alleys , 10 minutes from Jemaa El Fna square and the souks. Discover a welcoming and authentic Morocco in a traditional and charming house where modern comfort (air conditioning, Wifi, satellite TV ...) is perfectly integrated with Moroccan architecture. * Three lounges, one of which is decorated with a fireplace and the other with a beautiful traditional fountain. * A terrace of 165 m2, sunny 365 days a year offers a panoramic view of the Medina, the gardens of the Royal Palace and its storks. * A large heated pool with a swimming feature at "Counter-Current". * On reservation before arrival, treatments in our hammam in Tadelakt. This service, linked to an attentive and discreet welcome, will make your stay in Marrakech a pure moment of conviviality, intimacy and happiness. Usually served in one of the patios by the pool or on the terrace breakfast consists of tea or coffee, pastries, local bread, traditional pancakes, and of course a delicious freshly squeezed orange juice. pressed. With a modest supplement, let yourself be tempted by the Moroccan dinner prepared by our cook with a solid experience. Amina regularly adapts the map according to the seasons. The meal is made entirely from fresh market produce and recipes from generations of cooks. Combining the most subtle spices with delicious vegetables, meats or local fruits, Moroccan cuisine is extremely varied. We are equipped to receive young children you will find on site at your disposal: a stroller comfortable for walks to the souk, a car seat to French standards and of course a cot. We offer an airport transfer service as well as excursions at preferential rates. Do not hesitate to ask us for our brochure detailing these services. "The Kasbah of Jade" responds to an ecological approach, respectful of the environment. In 2014, we finalized the renovation with a desire to respect the Moroccan know-how and using traditional materials (local wood, painting Tadelakt). Our Riad has solar panels, a heat pump to reduce electricity consumption. The purchase of fresh and retail products allows us to reduce our waste while making the neighborhood economy work. The riad has 3 beautiful and large Suite and beds in one of our 3 rooms can serve as an extra (3 people). First, I'd love to say how amazing our host was! He and his lovely family (his wife and two children live on the first floor- guests are on the 2nd floor) truly went out of their way daily to make sure we had everything we needed from transportation to exchanging money and letting us know what areas/sights to see/things to do! However, the Riad could have been in better shape. The sheets we slept on looked/felt like they were about 10 years old and while they were moderately clean (a few of the sheets had stains)... honestly they just need to be replaced with new bedding. One of the bathrooms- in the shower we didn't even want to step in there without shoes on. Most importantly, at night this area is just not safe. At all at night. We had to be back in the Riad around 9pm which cut our days short. Our host let us know that if we are out later that we should have our taxi driver take us directly to the door of the riad... but most taxi drivers would only drop you off at the entrance and then its still about a 8 minute walk to actually get to the Riad. Overall, again the host and his wife (who made breakfast every morning) was really fantastic but the owner of the Riad should consider just doing some basic upkeep and maintenance of the location. And if you're more into the nightlife of Morocco I would not recommend staying here.just again because the area is so unsafe. Overall we were very pleased with the Riad. Please be careful, however, when booking this Riad. There were 5 in our party and at the time I booked and paid for the Riad I thought I was getting 3 bedrooms. Days before our arrival, the owner informed me that we would have just 2 bedrooms. I had to get Homeaway involved and the situation was eventually resolved (we got the 3 bedrooms per our contract). Also, it’s important to know that the Riad is shared with the host and hostess and their 2 children (a baby and toddler). We didn’t have an issue with that but would have appreciated knowing in advance (the description in Homeaway only mentions the hostess living on the premises). As far as the accommodations, the main room bathroom shower nozzle holder is broken. The middle room’s bathroom had small nats (bugs) in it. These issues were minor, we were able to work around them. The meal that was prepared for us upon our arrival was delicious. The host and hostess prepared our breakfast each morning at our requested time. I can’t speak highly enough of the host and hostess, they were so gracious and made sure we were comfortable not just in the Riad but as we headed out into the Medina. The host gave us a wealth of information and showed us around the Medina. The Riad is in the Medina, which is very crowded with many open air markets/commerce taking place. Our teenagers had a difficult time adjusting to that, they might have done better modern (new) Marrakech but it was important for us to experience the culture. My family of four rented this entire riad for four nights. The location is great. It is in the heart of the Kasbah and a nice respite from fast pace of the rest of the Marrakech medina, yet still close to everywhere we wanted to go. The property manager, Adil, is such a friendly guy and provided exceptional service throughout our stay (do note if you rent the whole place that he resides on site). We ate breakfasts and one lunch at the riad and the food was delicious. 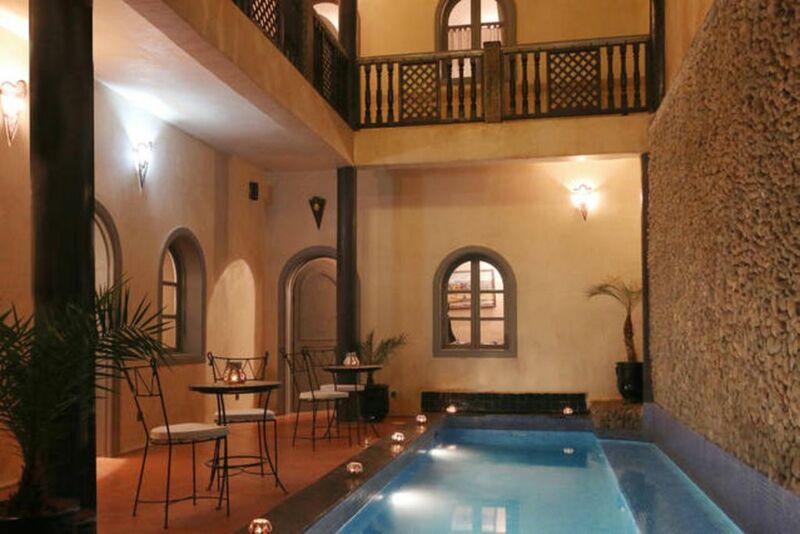 The actual riad looks just like the pictures here. We would stay at this riad again and recommend it! Nous avons passé 4 jours au Ryad, avec des amies. Le Logement est parfait, bien situé et au calme en même temps. Adil a été aux petits soins pour nous et son épouse nous a cuisiné un très bon couscous. Concernant la literie dure et le débit d’eau, vu dans d’autres commentaires, je tiens à préciser que, pour avoir fait plusieurs Ryad à Marrakech, c’est partout pareil. El anfitrión genial, no ha podido hacer más por el grupo, atento en todo momento a nuestras necesidades, un sol. Gracias de la part de Adil et d'Amina. Rare privilege in the Medina, the taxi will drop you to the riad. We are close to the Saadian Tombs. To see Absolutely: The Place Djemaa el Fna, visit the souks, the Majorelle Gardens, a day in Essaouira, Ouzoud waterfalls, Ourika Valley.